SCVHistory.com LW2920 | Magic Mountain | Accordion Player, 1974. 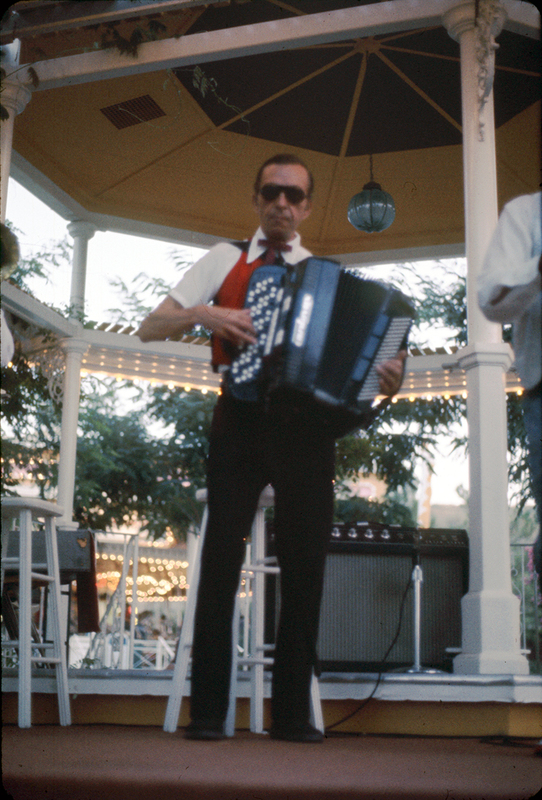 Accordion player performs at Magic Mountain, 1974. 2x2-inch transparency (color slide film). According to former employee Mike Metzler (pers. comm. 2017), the accordionist is Frank Vengrin, who played with Jimmy Alu and his Dixie All-Stars. Former employee Stephen Karolyi writes (pers. comm. 2017): "This picture was taken at the Carousel Bandstand at the front of the park, located by the Grand Carousel. I think this accordion player is part of a group performing for one of our park-wide, entertainment-oriented special events. ... An accordion would not have been part of the normal instrumentation of a group we would have hired routinely to play at the Carousel Bandstand. The groups we hired to perform at the Carousel Bandstand were much younger." LW2920: 9600 dpi jpeg from original transparency purchased 2017 by Leon Worden.